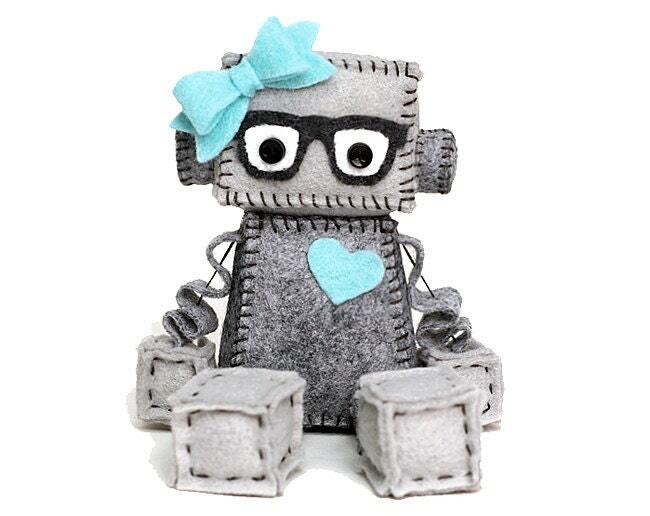 Geek girl robot has a bow and heart and cute nerdy glasses. She would make an awesome gift for your special fangirl (or for yourself). Choose the color you would like for the bow and heart. Colors are shown in the last image. Robot is about 4 inches tall sitting (not including the height the bow adds). It is made of premium wool felt, cotton embroidery floss, little plastic buttons for eyes and a light turquoise felt heart.